Take Advantage of Our Unique Program For Breeders! Your clients are looking to you for advice on what to feed their new pet. They usually have no clue which food is right for them and yet they will purchase pet food/treats 6-8 times per year. Next to providing a stable, loving home, feeding the proper diet is the most important factor in raising a healthy pet. It's always a great idea to send home instructions on proper care and veterinary visits. Be sure to also instruct your clients on the safest, freshest, and most nutritious food. Let us show you a REAL Breeder Program that can actually allow you to feed your kennel for free and put money back into your business each and every month just by doing what you've always done - recommending a good pet food to your clients. You've spent at least 8-12 weeks of hard work ensuring your puppies are healthy, happy and well-adjusted before going to their new homes. Our breeders program offers you the opportunity to see your puppies stay healthy for life. As a breeder, you are already recommending pet food when you send your puppies to their new homes with the food that they're eating. Instead of letting someone else earn a residual income on your pet product referral, now you can start earning that residual income by recommending holistic pet food. Our simple program gives you a fully functional e-commerce website that you can link to your current dog or cat breeder site and earn commissions and bonuses from every sale of Life's Abundance Products. Your customers purchase direct from your site and Life's Abundance ships them their pet food - No Inventory, No Paperwork, No Worries! Beginning the second month, the maintenance fee is $10.95. The company maintains your site and keeps everything up-to-date as well as processes and orders and handles shipping. Human quality ingredients. Life's abundance has gone to the effort of obtaining APHIS (Animal Plant Health Inspection Services – a division of the USDA) European certification. Any pet food that is made in the US that is shipped to Europe must have this certification that requires all ingredients to be of human grade/quality. Life's Abundance does not ship pet food to Europe, they go to the trouble of obtaining this certification to prove to customers the quality of ingredients. Plus, this certification requires that not only is the pet food manufacturing plant inspected, all vendors are inspected as well, by the USDA. Very few pet food manufacturers bother to have this certification. The Life's Abundance Breeder Program enable you to purchase 40 pound bags of Life's Abundance Dog Food and Life's Abundance Cat Food at a heavily discounted price. Please note that the shipping is not discounted like our wholesale and retail bags. Please contact us to request a quote for the total price to your area. As a Life's Abundance Field Rep you also have direct access to Dr. Jane Bicks, holistic veterinarian and Life's Abundance product formulator. This means if you or your customers have questions regarding any of her products you speak with her directly! What other pet food manufacturers let you speak with their formulator? Click Here to Join Life's Abundance Today! Recommend our starter pack to your puppy clients to help your precious puppies get off to a healthy start. Dr. Jane Bicks, our veterinarian formulator, chose each product in our Healthy Start Pack for a specific reason. Each Pack contains Life's Abundance Premium Health Food, Life's Abundance Wellness Food Supplement, Antioxidant Health Bars, Tasty Rewards Training Treats, PorkHide Bones, Ear Care Formula, Revitalizing Shampoo, and Bath Fresh Mist. The Healthy Start Pack also contains “The Truth About Pet Food” DVD absolutely FREE. Earn $26.43 each large starter pack you recommend to your puppies new forever homes. Get your puppies off to the best start and put money back in your pocket! A litter of 10 puppies can earn you $264.30 plus the residual income for their lifetime with each purchase of Life's Abundance products. Offer the best nutrition for your puppies for their entire life today. How Do I Get Started With This Awesome Breeders Program? If we could show you a way to earn a residual income - month after month, year after year - by recommending our holistic, veterinarian-formulated pet food, would you be interested? We recommend the Executive Rep starter package that includes samples of the products so you can familiarize yourself with the product line. This is so important so that you can see, taste, smell the products and see the results on your own pets. Use the products you are selling! What better testimonial than your own? Comparing ingredients from one pet food to another is a good place to start. If you see negative ingredients like by-products, corn, wheat, soy, bone meal, and other less than optimal ingredients, you can safely eliminate that product from your consideration. But, what about pet foods whose labels don't look too bad? That is why we have assembled some of the most important things to consider when comparing any food to Life's Abundance without the need to become an "ingredient expert". Our foods are always Super Fresh because we do not sell through Mega Chain Stores. In fact we make small frequent batches of food to ensure freshness. Your pet food will never be old. Most orders are delivered before the food is even 6 weeks old and there are no middlemen. Most brands of food are sold in the mass market and stored multiple times before you buy them. In fact, it is not uncommon to find pet foods that are already 6 months to 1 year old by the time you buy them. How nutritious do you think your pet food will be after sitting around in semi trucks and multiple warehouses? One of the hallmarks of our holistic pet food company is the level of education you will receive when looking for the right food for your pet. Dr. Jane Bicks is the exclusive formulator of our entire product line and she makes herself available for a LIVE Q&A. "We sell a lot of this one" or "This food is on sale right now". This leaves you as much in the dark as when you started. Remember, your pet eats the same thing every day. It is important to know what you are feeding. We Only Make The Best with nothing less than human quality ingredients. Life's Abundance for dogs and cats is formulated to meet the requirements for All Stages of life. Our philosophy is simple. People who love their pets will naturally want to feed them what is best, not what is cheapest. Most pet food companies make several varieties to capture your business and your budget. Consider the mixed message that is being sent by these competing products made by the same company. *If one is an improvement over the other, why hasn't the old food been discontinued? *Why should I pay more for one if both are supposed to be good for my dog? *Is this just clever marketing? We use only USA Ingredients. Dr. Bicks and Life's Abundance have been in business for the past 13 years and have never been involved in a recall. Much of that has to do with the first rate ingredients, the clean manufacturing facilities, and the fresh delivery practices that we use. While tainted ingredients from cheap sources is a constant threat, there is also an ongoing issue of "acceptable" ingredients that pet owners need to be aware of. Deadliest In History. In March 2007, our nation experienced the single largest recall of pet food ever. More than 100 brands of pet foods were pulled off the shelves due to tainted ingredients. Thousands of pets were sickened (the FDA received more than 17,000 reports) and an estimated 20% died. You can view the list of recalled products from the FDA website here. We hope you'll agree with us that choosing your pets food is an important decision. After all, your pet will eat what's in his dish 95%-100% of the time, so a little bit of something bad, can amount to a big problem. Our goal is to inform pet owners that there are healthier options out there. We intend to help pets live longer, healthier, and happier lives, while revolutionizing an industry that is in need of a change. By offering Life's Abundance Pet Foods you are now part of Dr. Jane Bicks' mission to help pets live longer, healthier, happier lives. That mission not only includes making the best possible food, treats, supplements, and grooming products, it also includes unprecidented 'Customer' and 'Field Rep' support. Twice per month Dr. Jane Bicks holds a Live - National Conference Call so that anyone in the country (including you and your clients) can ask whatever support questions you would like. Whether you have a product concern, a health issue, or just need nutritional advice, Dr. Jane is ready to take your call. Plus, as a Life's abundance Representative, you can speak with Dr. Bicks whenever necessary. Life's Abundance also has their own staff of trained Customers Service Representatives ready to assist you whenever you need help. We have chosen to feed very high quality foods over the years and for doing that we have reaped many benefits with our dogs and puppies. Better health, beautiful coats, less waste, etc. Our dogs are thriving the same way on Life's Abundance. It was very important to us to not sacrifice quality and we didn't. We were however, having to buy three different kinds of food for various dietary needs and also for one very picky Poodle. With Life’s Abundance we haven’t had to buy any other food because everyone is doing very well on it. Even Winnie the Poodle loves Life’s Abundance! Our puppies have had no loose stools; an issue that we had to deal with before with other foods. They are thriving! We offer a 72 hour general health guarantee (giving the new owner enough time to take their puppy to the vet to be examined) standard. We offer to extend a two year genetic defect guarantee if the new owner keeps their puppy on Life’s Abundance for those two years. We had a food requirement before and were doing this very same thing, but we didn’t make a cent for the referral. Making Life’s Abundance a feeding requirement does two things for us, it helps us keep track of who is actually buying the food, allowing us to keep better record, and also have the confidence to guarantee the puppy because we know that the puppy is being provided excellent nutrition during his or her developmental years (so very important!). Plus, for this referral we are now making a steady income on commissions. Additional income streams are always welcome when feeding a lot of dogs! After three months of doing the same amount of work, we are very near earning enough money to cover our dog’s food (this is huge for our budget!). I was so frustrated as a small breeder until I found Life's Abundance. My breeding female had terrible problems with diarrhea when she was pregnant and it was especially when she was lactating. She was really suffering and when I asked the vet how I could help her, he said to give her Pepto Bismol....no change. He said to cook her some rice....no change. He said to give her 2 oz. of unprocessed cheese twice a day to firm her up....no change. The poor thing suffered until weaning took place. I was open to something better when an acquaintance introduced me to Life's Abundance. I thought I would try it for 30 days to see if it helped. The first thing I noticed was consistently firm healthy stools! My 7 yr. old Golden Retriever who was slowing down became "puppyish" again. Her coat was shiny and even my husband noticed she was leaving less hair on his black dress slacks. Then my female got pregnant and sailed through the pregnancy AND the lactation without any diarrhea!!! I will never feed anything else, and I won't trust our puppies to anything else. And now that I became a rep. and share the news about Life's Abundance, I feed all my dogs their food, supplements and treats for FREE! All breeders should know this information!! Thanks so much! We are just getting started with "Life's Abundance" but my oh my what a difference it has made. We tried the samples on one puppy out of a litter & he looks so much more healthy & active. We were absolutely amazed. Now we want to use this for all of our dogs & will be recommending it to all of our customers & friends. I felt it was important to share my testimony regarding dog food. In years past I always used Nutro. A couple of years ago a breeder friend told me about Life's Abundance, but I did not want to change. Finally, after about 6 months, she convinced me to try it. With all of the food recalls and not ever being sure of where the food was really coming from, I decided it was worth a try. My dogs loved it and looked awesome. In addition, we had less clean up in the yard and the smell was not as bad. I quickly realized that the dogs were utilizing the ingredients and less was wasted. With no corn, or wheat, by-products ,or chemicals I became a strong advocate of holistic food, specifically Life's Abundance. It is vet formulated and made fresh and delivered to your door. I fed it for a year and a half until I started to find that some folks were having a hard time affording it with the economy etc. I looked into foods that would be equivalent and came up with Canidae. In the fall of 2008 I began feeding Canidae and referring all of my puppy families to Canidae. In the beginning all seemed fine. Feb 2009 we added a new dog to our family. He did fine at first, but then started having problems. His stool was loose, frequent and smelled bad. He had a few bouts of vomiting as well. He would have gas that was horribly offensive and not normal. We thought maybe he just had stomach upset from something in the yard. Then he had a couple of peeing accidents in the house like he did not have control. He acted hungry but also like he overall did not feel good. In addition he had a few sores that were itchy on him as well. I began doing more research on the food and found that many other folks had had the same problems on Canidaehttp://www.consumeraffairs.com/pets/canidae.html . As I was reading, I also tied in the fact that two of my other dogs had lost weight and were itching a lot and had never had skin issues before. They also were losing their coats and it was not the time of year to be blowing a coat. I had also been noticing along the way that I had to pick up a lot more (smelly) stool in the yards. In April I decided it was time to go back on Life's Abundance. Immediately the stomach problems and urinary problems were resolved. Within two weeks the other two had gained and skin issues were gone. No stomach issues, normal stools (and less of them), weight gain, all problems solved. My case is proven and I will never change again. Although it may seem like a lot of money, in the long run it is not. You feed less, they are utilizing more, and you can feel good that you are feeding your dog a healthy diet that is not causing harm to his body. Commercial dog foods require that you feed them alot more, so it does not cost less to buy cheap food. You are also getting your protein source from corn and wheat instead of meat that carnivores were created to consume. Corn and wheat are just fillers that come out the other end since their bodies were not made to utilize them. Another consideration is that marketing techniques have come up with dog foods for this and dog foods for that. When you think about it, in the wild dogs do not hunt other food for their puppies, they just eat more. So why the special food? We take the marketing for face value, and as consumers trust the pretty bag and commercials. End result...dog food companies are making millions. They even have Chihuahua food, Yorkie food, and yes...even Golden food. I have chosen to go the route of a good balanced diet for my carnivores and I feel good about their health as a result. Do your own research and make an educated choice. I just felt it was important to share my personal experience with you. Finding the right dog food for our 3 bulldogs (2 French and 1 American) took awhile. Bulldogs have special dietary needs due to the finicky nature of the breed. Our dogs have been happily eating Life's Abundance for 5 years now and we have seen only positive results. Our dogs have thick shiny coats of fur, high energy levels, and excellent overall digestive health. We have also raised 2 of our 3 litters of French Bulldog puppies on Life's Abundance. The puppies were weaned straight from nursing to eating the same Life's Abundance food that we feed the adults. The 2 litters raised on Life's Abundance consisted of larger, more active puppies than the first litter, which was weaned to traditional puppy chow. 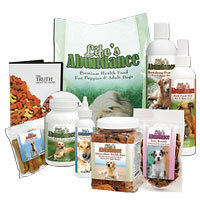 We always send a bag of Life's Abundance home with our puppies. We have found that by sending the puppies home with Life's Abundance and letting new owners see the benefits firsthand, many of them choose to continue feeding Life's Abundance. Our bulldogs are valued members of our family and we would never dream of feeding them anything else. Barbara K.